I used the search function for this to no avail. 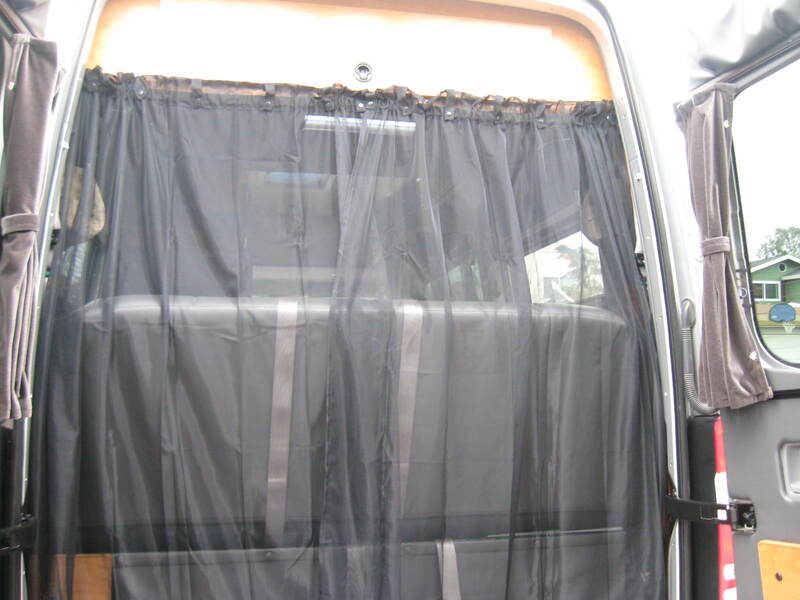 I would think I am not the first to ask about or try to invent some easily attached, easily stowed, but effective bug netting for a van. I spend a lot of time camping in Utah in bug season and it can get pretty nasty, especially at night with any lights on in camp. I guess I was envisioning magnetically attached screen for the barn door, maybe the back doors, as well. I was going to feel around the front windows to see if magnets would work there also, but there's a lot of plastic there. I would prefer not to have to resort to velcro mostly because the sticky backing can get hot and melt and get messy. Anyway, I hoped that rather than reinvent the wheel maybe someone could point me to some existing plans or products. As for the screen, it's got to be able to stop gnats so pretty find mesh. We use the barn door velcro version (purchased from the SMB Store) and the adhesive has held up well. Our van is parked outside and the interior gets extremely hot in the summer months. Haven't had any problems with the melting/slippage. Skeeter beater applies quickly & works great. 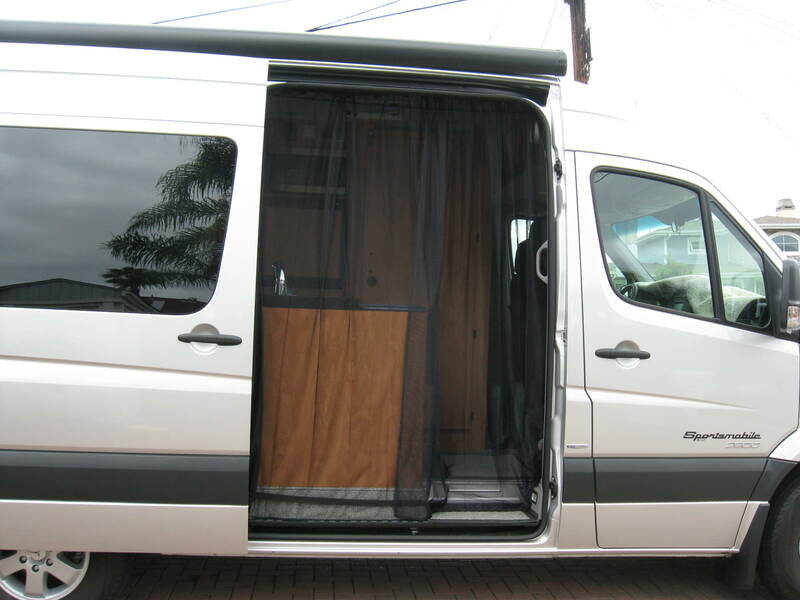 As suggested already by tlg, side & rear doors available from Sportsmobile store - fit very well. Also have not had any issues with the Velcro application, and the zipper in the middle of the side door screen is convenient. Works well. Except at extended mirror on our 1997 E350. I use some duck tape there. It's a bit hard to tell from the SMB store description and pics of the side barndoor screens how it works. So is it fastened by continuous strips or patches of velcro around the door frame, including the bottom? I don't suppose anyone's got a pic of exactly where in the frame they go? How about rigs with the storage box attached to the inside of the rear door? I assume you just have to take the screen down completely if you want to close either or both doors? Oh, and how do the access zippers work on that side door? Is it one or more zips? Hard to tell from the pics again. Our last camping trip was plagued by biting bugs and our DEET must have expired as we went home with lots of itchy welts. It was time to make bug screens for “Sparky.” On our prior Ford SMB AKA “Sporty,” we fashioned window screens held up with magnets for the barn doors. However, the magnets were so strong, they tore through the screening and loved to stick to each other and everything else. Velcro, of course, is another option but we find the glue loses its adhesive stick in the heat and then pulls off of the metal. This time around, we tried a different tactic. Lowe’s had some nice, outdoor mesh curtains with weighted bottoms that worked well after shortening the length a bit. 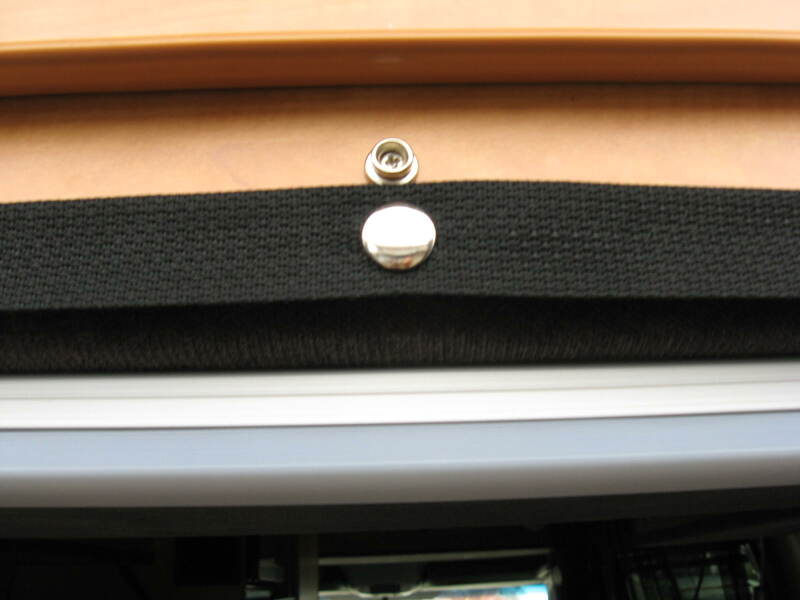 Copying Sportsmobile’s use of the screw-in snaps for many things, we hung the curtains using lengths of nylon strapping as curtain rods snapped onto the ceiling for the side door and onto the cabinet for the back doors. They are easily removed by unsnapping or can just be pushed along the strap and out of the way if not needed. The curtains come with a rod pocket at the top to slide a curtain rod through. 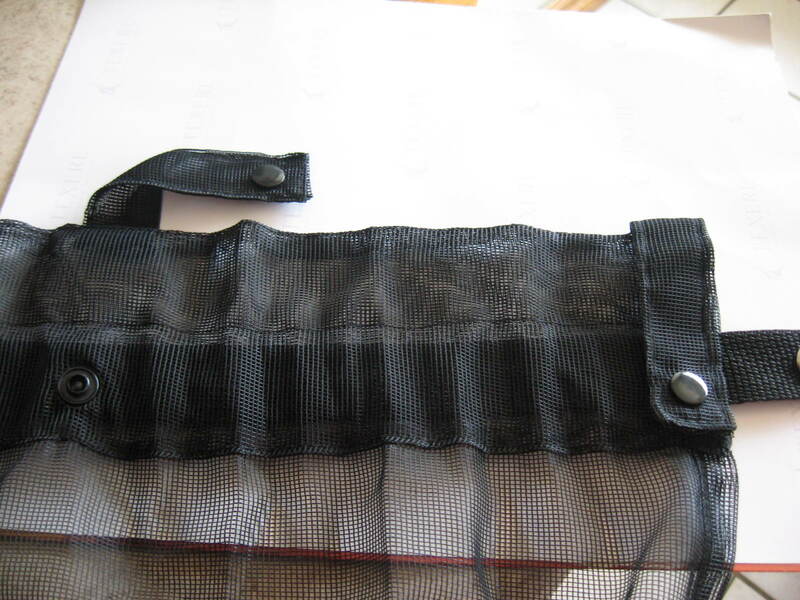 It can also be hung via the multiple loops with plastic snaps that can fasten over a rod or rope without the need to thread through the rod pocket. We could have hung a single curtain sidewise and sewed it to the strap but liked the drape and increased privacy provided by sliding them over the strap.